Email marketing is a form of direct marketing and is the perfect marketing strategy to broaden your market reach or reward customer loyalty and enhance repeat business. We make use of the best email marketing platforms to mail out your message. Customer segmentation, specific targeting, special promotions, etc... The possibilities are endless. 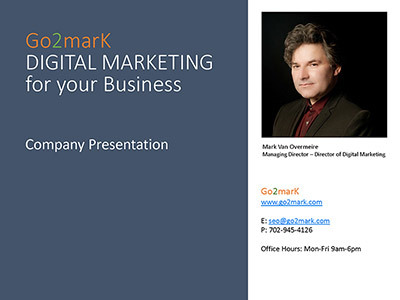 Go2marK is the perfect partner to set up and manage your email marketing campaign. Before taking on your email marketing project we determine what your EM goals are. Do you want to promote products or services? Share important information about your company? Create a larger following on social media? Go2marK will set up and manage your email marketing campaign from start to finish. What do you get from Go2marK?